As Tony Williams says, "plan the drive and drive the plan." Start with 100%, not 88%, not 90%, but 100%. Drive conservatively and monitor your efficiency. If there's a choice between driving 75 mph and 65 mph, choose 65 mph, slower if you can do so safely. Driving conservatively increases efficiency and consequently range. Don't use passenger cabin heat unless you need to clear the windshield of fog. Use your seat heater and the steering wheel heater instead. Cabin heat can dramatically reduce your range. You can monitor the energy used by your accessories on the energy screen of the central display. PlugShare is your friend. Use it. Plan your charge stops and always have a Plan B. Sometimes charge stations are broken or are occupied. If they are occupied determine how long the other drivers will be before striking out to find your Plan B charge station. They may be finished and will soon move on. In that case you don't want to drive to another station when you don't know if there's someone already at that station. Check PlugShare before striking off. You may want to stop somewhere before reaching Santa Clarita--for a break if nothing else. Make that intermediate stop a charge stop. Stop to charge and take a break at the same time. 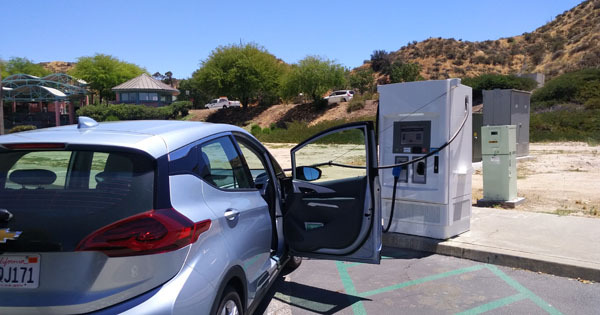 There are three charge stations in Santa Clarita. Bridgeport Marketplace is the closest to the freeway. It's on the EVgo network. Metrolink is a little further but it is on EV Connect. There's a third but it's further from the freeway. It's a last resort. Remember, you can never drive to "0". The Bolt will turn off at 2%-4% to protect the battery. I've never run it that low so I don't know for sure. Therefore, you should always have a reserve or a cushion. My minimum is 20%. When I know the route and how much energy it takes, I run the battery down to 15%, but otherwise I try to maintain a reserve for the unexpected--strong wind, rain, and so on. 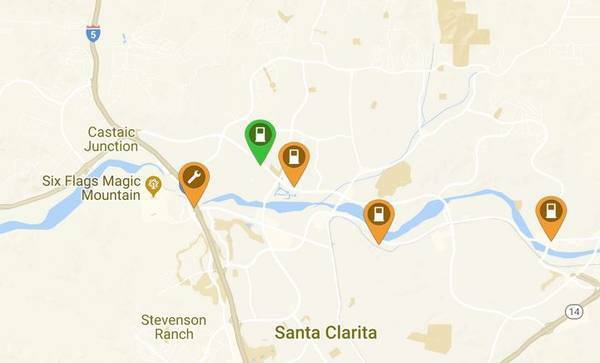 EV TripPlanner says it will take a whopping 56 kWh to get from San Diego to Santa Clarita. There's only 60 kWh in the Bolt. Chevy's app says it will take 48 kWh or 80% of your battery's capacity. Either way you should monitor you efficiency and consumption. Chevy's app is more accurate, but you're the driver and responsible for your own safety. You will need a minimum of 25 kWh to get from Santa Clarita to Bakersfield. I'd just figure you'll need 30 kWh or 50% of the battery's capacity. You also need a cushion of 10% to 20% for piece of mind. Let's assume you arrive at the charge station with 20% remaining. That's your cushion or reserve for the next leg. You will now need to add 25-30 kWh. 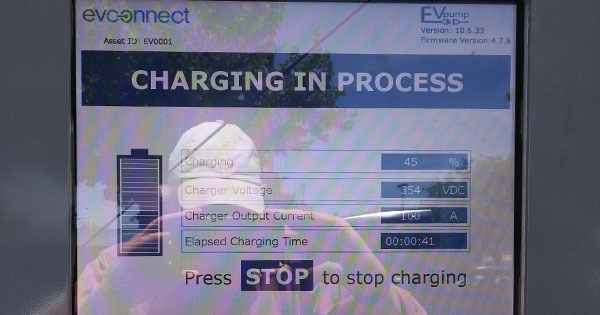 On a 125 amp (50 kW) charger, you will have to charge about 30 minutes. On a 100 amp (40 kW) charger, you will need about 45 minutes to one hour to get 30 kWh. Remember it's kWh that you want and not time. The charger tells you how many kWh have been added. Take whatever time you need to get the kWh you need. Keep a log book and track the energy you used on each leg. That's helpful to other drivers. It's also helpful to you by making you aware of how much energy the care needs to go certain distances. It's a good way of learning how to use the car. Good luck and drive safely.